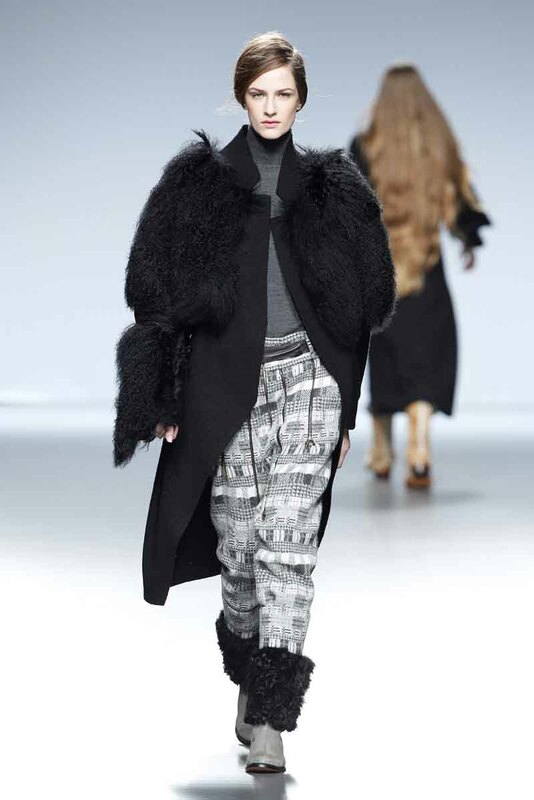 On Friday, February 14, 2014, at the Feria de Madrid, Roberto Lopez Etxeberria unveiled the Etxeberria Fall 2014 collection during Mercedes-Benz Fashion Week Madrid. My last collections (A/W 13-14 and S/S 14) were developed around the idea of the search for wide figures and volumes, with scarcely seams or pleats, and built trusting in the patterns and the dimension of the fabrics in order to solve the objects. The inspiration of these two collections (the Europe in the times between wars in the winter collection and the rural Spain in the summer one) allowed and fitted perfectly to the expected play of volumes. Nevertheless, this research eventually moved me away from the classical tailoring, one of my most important models and primitive driving force of my work. For that reason, and willing to revise and coming back to these origins, the collection that I am presenting places the classical tailoring as the center and base of its development. With the collection Midwinter men A/W 14-15, I am introducing a complete man’s wardrobe for evening, night and gala. The figures fit in waist and knees, and get emphasized in shoulders and hip, by means of Japanese sleeves and double pleats, with seam or zippers. The volumes find their inspiration in the English tailoring from the 1920’s, especially in the night and gala garments. The Neapolitan tailoring from the 1950’s plays an important role regarding the silhouettes and lengths. Among the fabrics, fundamental in my work, I used wool and felt, combined with leather and fur as usually. The felts draw references to classical fabrics such as herringbone, pin-stripe, hound’s-tooth and jacquard, and combine with each other by overlapping or simple cuts, in a search of mixes that puts them out of the common contexts. Shoes and boots revive the mixes of the garments as well. Midwinter men aims to provide the man with elegant garments which are daring at the same time, seeking to individualize him beyond his dress code, making him feel comfortable, elegant and special.